A team of Researchers from Tohoku University have formulated an innovative technique for fabricating semitransparent and flexible solar cells with atomically thin 2D materials. The new technology enhances power conversion efficiency of up to 0.7% - this is the maximum value for solar cells reached using transparent 2D sheet materials. Transparent or semi-transparent solar cells with superior mechanical flexibility have attracted a lot of attention as next-generation smart solar cells. They can be used in a variety of applications such as on the surfaces of windows, human skin, and front display panels of personal computers and cell phones. But problems remain with regards to enhancing their power conversion efficiency, flexibility, stability, optical transparency and scalability. Guided by Associate Professor T. Kato, the research team demonstrated easy and scalable fabrication of semitransparent and flexible solar cells using transition metal dichalcogenides (TMDs) - an atomically thin 2D material. Using a Schottky-type configuration, power conversion efficiency can be boosted up to 0.7%, which is the maximum value reported with few-layered TMDs. 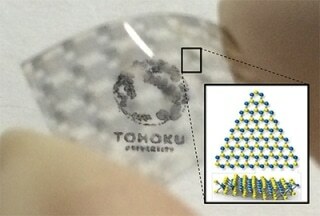 Clear power generation was also noticed for a device fabricated on a large transparent and flexible substrate. Since our device structure, Schottky-type solar cell, is very simple, the TMDs-based Schottky-type solar cell possesses good properties for scalability, which is one of the most important elements for use in practical applications. The transparent and semi-transparent solar cell can be used in a variety of ways. This new type of solar cell is likely to have impact on the technologies we use in daily life in the near future. Details of this research have been published online in the September 20th issue of Scientific Reports.